I am always on the look for interesting funny stories and at the same time stories which are comprehensible to my learners. A few months ago when I was busy breastfeeding, I was reading the TPRS bible “Fluency through TPR storytelling” by Blaine Ray and Contee Steel and one chapter entitled “Kindergarten Day” caught my eyes. Susan Gross, my other TPRS heroe (as well as Sabrina Janczak and many other passionate teachers! ), innovated this idea which was inspired by the recommendation that teachers read stories to students. The teacher would select a children’s book with colorful pictures and she would read the story as done in elementary school. The benefits of this activity are that it provides interesting comprehensible input and the affective filter is low. I do read quite a few bedtime stories to my boys and those stories entertain everyone of us, from my 10 years old to my 4 years old to even myself!!! Therefore even though I am teaching adults, I looked for an entertaining children’s story with animals. And I found this little gem ” Aboie, Georges ! ” by Jules Feiffer which is the perfect story for beginners because it is repetitive and has many high frequency verbs like ” dit / fait / font / emmène “. At the same time the story has a twist which makes it interesting to follow. It involves circling ” fait / font ” and it does also repeat ” encore ” and ” loin ” which are also high frequency words. Moreover it is fun to connect it with the animal sounds in different countries. I connected with my learners via Skype and asked them to copy the link of the video above in another tab: ” Copie le lien dans une tabulation ! “, I then asked them to mute the sound: ” Coupe le son de la vidéo ! ” so that I could tell the story at our own pace and go through the circling process. Surprisingly enough, my adult learners had more fun than my teenagers! As a home practice, my learners can read the story again and listen to it being told in the gorgeous Quebec accent! I have also written a parallel story with a kitten called Victor. 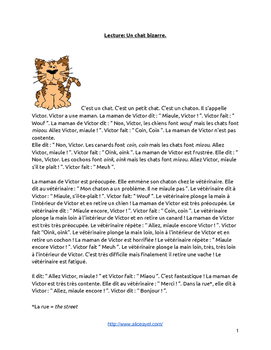 You can purchase the reading activity along with comprehension questions, a grammar/vocabulary part to find out about animals (adults and babies) and to reinforce the verb ” faire ” in the present tense, a creative writing to use the key structures and finally a teacher corner with more links and tips to extra activities and ideas: videos, flashcards… on my Teachers Pay Teachers store. What about you? Are you reading children’s stories to your learners? Do you hold “Kindergarten days”? I would be interested to find out about your own experiences!